One of Italys most famous cheese, matured for over 24 months. Rich, salty & sweet in flavour. Known in French and English as Parmesan, although under Italian law officially called Parmigiano Reggiano, this is easily Italy's most famous cheese. It is produced exclusively in Emilia Romagna, in the provinces of Parma, Reggio Emilia, Modena and areas of Mantua and Bologna, all found between the Rivers Po and Reno where the cattle thrive on the lush plains. The cheese has been made for over 2000 years and today over 3 million cheeses are produced every year by some 560 dairies. The specific region of production and maker of any cheese can be determined from a number branded on the rind. If the number is less than 1000, the cheese was made in Reggio Emilia, held by many as the highest quality. If the number comes between 1000 and 3000, the cheese was made in Parma, Modena or Mantua, and over 3000 signifies production in Bologna. Our Parmigiano Reggiano comes from producer 841, and therefore from Reggio Emilia. Parmigiano Reggiano is authenticated with a Protected Designation of Origin (PDO) which specifies the region in which the cheese can be made, and the methods used. To make the cheese, the milk produced by the cows on the plains, fed exclusively on grass and hay (never silage) arrives at the dairy and is piped in to vats and left over night for the cream to rise to the surface. This is skimmed off to make butter, and the remaining skimmed evening milk is then mixed with fresh morning milk, calf rennet and fermented whey from the previous day's production, in typical bell shaped copper cauldrons and then stirred very vigorously. The milk coagulates very quickly, and the curd which forms is then broken down into small granules using a traditional tool called a 'spino'. The mixture is then heated to around 45°C and left for half an hour to allow the small cheese curds to sink to the bottom of the couldron to form a single mass. The mass is removed by hand by the cheese maker with the aid of traditional long, wooden paddles, cut into two parts so that each vat produces only two cheeses (each one using around 600 litres of milk), and wrapped in cloth. These are placed into moulds which give the cheeses their shape, and placed on plastic sheets with a unique number and the special marking band which 'brands' the cheese with its month and year of production, the cheese dairy registration number and the dotted inscription which completes the circumference of the cheese. The cheeses are then left in brine for just under a month before being taken to the maturation rooms. A cheese has to be matured for a minimum of 12 months, with a red seal applied to cheeses which have been matured for over 18 months. These have a milky flavour with hints of flowers and herbs which make the product ideal for snacking and aperitifs. After a maturation period of over 22 months, a cheese obtains a silver seal, and will have a stronger aroma and fresh citrus notes with a hint of nuts. Cheeses that have matured for over 30 months have a gold seal and a distinctive flavour with a dryer, more crumbly texture. 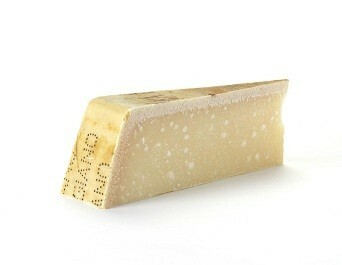 Our Parmigianno Reggiano is kept for a minimum of 24 months. This allows for the cheese to develop its complexity, with rich, nutty dried fruit flavours, but without being as crystalline and granular as some of the older cheeses. If a cheese does not meet its PDO requirements for any reason, all identifying marks and the dotted inscription acround the circumference of the cheese are removed.